For the first giveaway this month, Hijab Style is giving you the chance to win a Pleated Ruffle Belted Dress from Modern Mary! To enter all you have to do is become a fan of the Modern Mary Facebook page, and 'Like' this photo on their page. 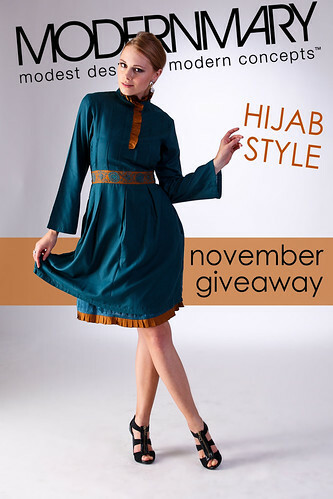 Send an email in with your full name and city with 'November Giveaway' in the subject line to hijabstyle@hotmail.co.uk. Please note that if any of this information is missing, you will not be entered into the competition. The deadline for entries is midnight GMT on Thursday 10th November 2011. The winner will be chosen at random and contacted via e-mail. Aaah, I love that dress best of all in their collection! Hope I win! I love how it has that elegant "antique" feel to it, the colours are brilliant as well!